Outreach to community organizations, schools and universities to educate the public about the victim service programs available in the state. CCVS grant funding supports ongoing staff and program development to promote trauma informed practices that support the provision of quality services. The CCVS Grant Programming is governed by federal and state regulations. These are incorporated in the CCVS Grants Plan Guidelines which are reviewed and approved by the State of Vermont’s Commissioner of Finance and Management on a yearly basis. Victim service programming in Vermont is currently supported 75% by Federal funds and 25% by State funds. 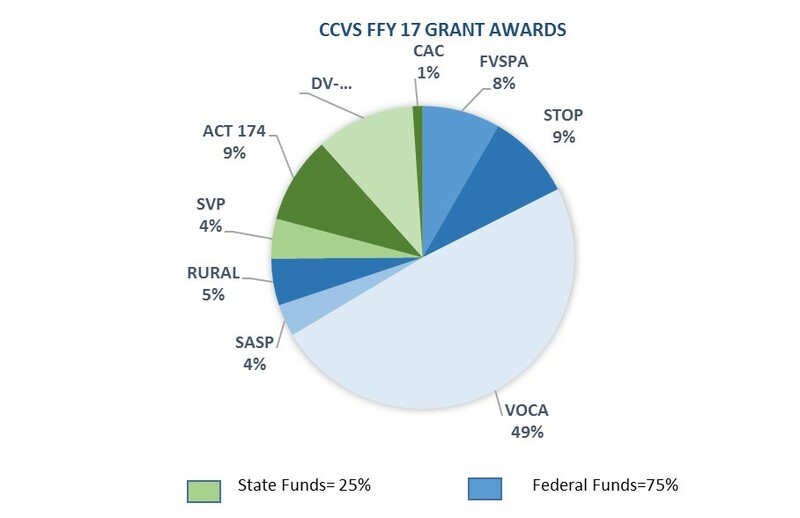 The largest source of CCVS’s grant funding comes from the Victims of Crime Act, (VOCA) grant program from the US Department of Justice. VOCA funds come entirely from fines and fees paid by convicted federal criminals, not tax dollars. To ensure the most judicious use of these federal dollars CCVS conducts extensive strategic planning. 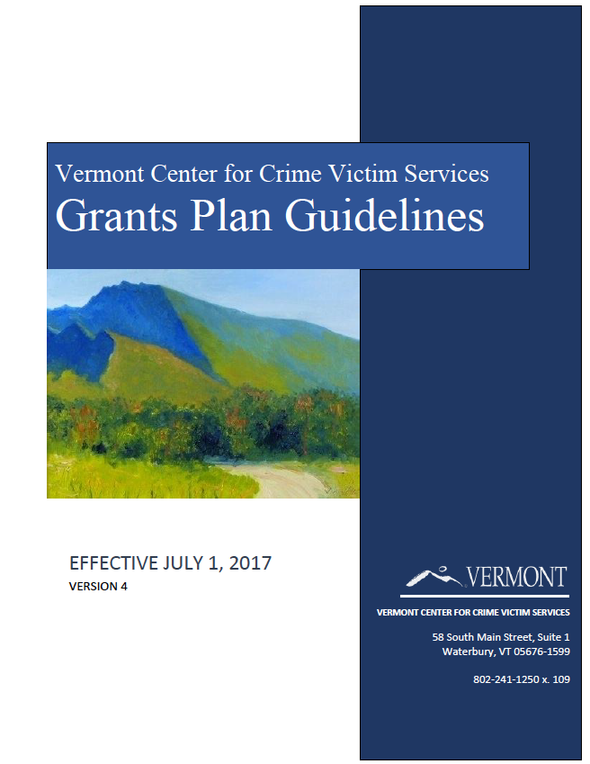 You can read more about this process in the CCVS VOCA Strategic Planning Guide, and the result of that effort in the Unmet Needs of Crime Victims in Vermont. supporting teams of law enforcement, prosecutors, and advocates who respond to crimes of domestic and sexual violence. Every four years CCVS conducts an extensive implementation planning process to determine the priorities for this funding. Vermont’s current STOP Implementation Plan covers the years 2017-2020. Quite often other OVW discretionary grants require proposals that relate to the state STOP plan. 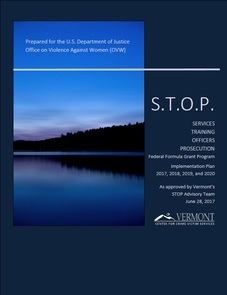 Vermont’s STOP Implementation Plan can be accessed here. to help adults and children dealing with domestic violence in the most isolated areas of our state. supports direct intervention and assistance for sexual assault victims. The Family Violence Prevention and Services Grant (FVPSA) from the US Department of Health and Human Services, Administration for Children and Families, supports professionals and programs that respond to incidents of family violence and dating violence. FVPSA assists crime victims by providing shelter, emotional support and other resources to adults and children who are experiencing violence in their personal relationships. Act 174 and Domestic Violence (DV) funding is set aside each year by the Vermont Legislature to support domestic and sexual violence programming. Vermont Child Advocacy Centers (CACs) bring together diverse professionals, including law enforcement, children’s advocates from the Department of Children and Families, prosecutors, counselors, Sexual Assault Nurse Examiners, doctors, and child advocates to work together to conduct interviews and make team decisions regarding cases of child sexual abuse. Vermont’s Special Investigation Units (SIUs) are also housed along with the Child Advocacy Centers. The Special Investigation Units will also respond to crimes of adult sexual assault. Vermont’s Supervised Visitation Program (SVP) grant supports eleven programs in Vermont that provide a safe location for a child to meet with their non-custodial parent.